Maxine’s Burn Caps is an advanced fat burner formulated to enhance fat breakdown, support metabolic performance, suppress appetite and balance hormone levels. Designed for women wanting to enhance fat burning, suppress cravings and improve cognitive ability. Burn Caps can be used as an all-day metabolism booster. What are Maxine's Burn Caps? Maxine’s Burn Caps is an advanced fat burner formulated to enhance fat breakdown, support metabolic performance, suppress appetite and balance hormone levels. Maxines Burn Caps in cooperate a mixture of plant botanicals and herbal extract that have up to 70% more active ingredients to support metabolic performance. Other ingredients include magnesium stearate, di-calcium phosphate and gelatin. Maxines Burn Caps formulation combines a comprehensive blend of quality ingredients and herbal extracts to maximise fat burning along with other benefits including appetite suppression, better focus and improved metabolism. As mentioned above, the formula contains four complexes which all serve a specific functionality. The fat burning complex utilises ingredients like L-carnitine, white willow bark extract and ginger root pepper that not only support metabolic performance but inhibit appetite and improve digestion. Moving on to the next complex, Burn Caps provides users with long lasting crash free energy by including performance enhancer and energy boosters like caffeine and theacrine. Maxine’s Burn Caps can be easily used throughout the day to help boost motivation and energy levels, which can sometimes be lacking when you’re trying to lose weight and are consuming a low-calorie diet. Although Burn Caps can be used as an all-day metabolism booster, it can also be used as a pre-workout for its energy boosting effects as well as the benefits of improving focus. The formula contains 150mg of alpha GPC, a highly effective ingredient for enhancing mental performance. Lastly, although the ingredients are very similar to their Maxine’s Skinny Pills, this supplement contains an extra complex to support women’s hormone balance. The fluid and hormone complex use kelp powder that functions to optimise thyroid and keep your metabolism in balance. The complex also includes Uva Ursi leaf that has an excellent quality in preventing water retention and bloating. This formulation has a significant increase in active compounds that all work synergistically to make it even more effective. Whilst most features of the supplement are positive, Maxine’s Burn Caps can improve by increasing the dosage for L-carnitine to maximise use of this ingredient in shuttling fat to be burnt for energy. Whilst most fat burners are a great weight loss aid, some users cannot take caffeine or other stimulants. Aside from this factor, Maxine’s Burn Caps is a useful supplement to add to your fitness journey. 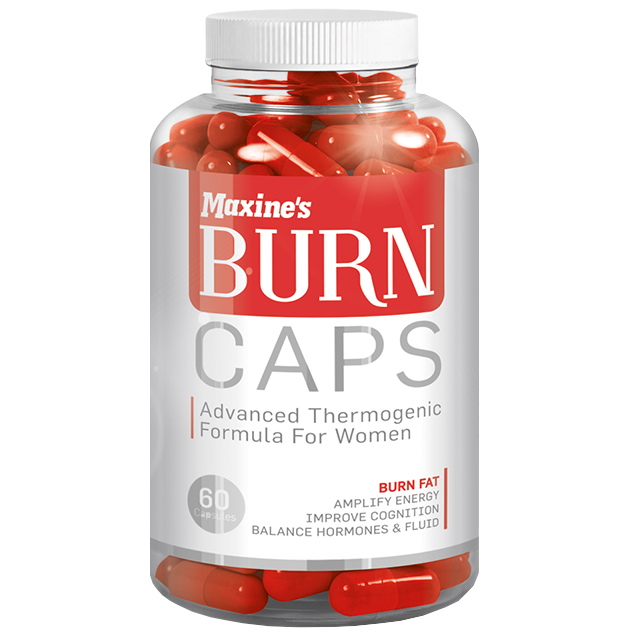 Maxine’s Burn Caps are only available in capsule form. They come in 60 capsule bottles that equate to 30 servings. Maxine’s fat burning energy and cognition booster works to enhance your body’s metabolism by actively targeting body fat stores, suppressing cravings and supplying long lasting crash-free energy to burning fat all day long. It is a solid fat burner for women that is in capsule form. For those looking for a convenient fat burner that does an excellent job in supporting your fat loss journey, then Maxine’s Burn Caps is one to get your hands on.